In How Often a Day Trader Should Trade the same simple answer was given: trade exactly how your trading plan tells you trade--whether that is how long you hold trades or how often you trade. That simple advice will serve you well once you have a trading plan, but if you're just starting, and don't have a plan yet, that advice won't help you much. The following guidelines will help you formulate a plan for how long you will trades, based on the type of trader you want to be and your natural inclinations. Prices don't move in a straight line. If the price is rising (uptrend), it will rise, pull back, and rise again. If we bought on the initial rise we can't be certain the price will rise again after the pullback. That only becomes evident in hindsight (see chart; click for larger version). If the price is falling (downtrend) it falls, pulls back and then falls again. If we went short on the decline though, we can't be certain the price will continue to fall following the pullback. When deciding how long you will hold your trades, one of the first decisions you'll make is if you'll hold through pullbacks or not. This also isn't an easy question to answer. Constant gyrations in the price mean tiny pullbacks are occurring all the time. Therefore the trader must define what a pullback means to them and whether they are willing to hold it. Not holding through a significant pullback means profits are limited to how much the price moves in a single thrust in your direction. If you are willing to hold through pullbacks, then you can potentially capture bigger profits because you may end with the price making multiple waves in your direction. For example, let's say you typically hold for one thrust in your anticipated direction (you don't like holding through pullbacks). You buy at $20 expecting the price to go higher. It moves to $20.10 relatively steadily, starts to consolidate and then begins to drop a little. You exit your trade at $20.07, for a $0.07 profit per share (total profit is $0.07 times your position size). Another trader also enters long (buys) at $20. They are willing to hold through a pullback or two and may have a stated profit target at $20.20, for example. Instead of exiting during the pullback (as the trader above did) they opt to hold. The price declines to $20.05 and then starts to rise again, reaching $20.15. There again it stalls out and begins to decline. It declines to $20.12 and then proceeds higher to $20.23. This trader held through a couple of pullbacks in order to attain their target price of $20.20. They have a bigger profit on one trade than the first trader. You can base your profit target on how much the price typically moves in one wave (thrust) or how much it moves in several waves, or be based on some other factor such as chart patterns (triangles or flags as examples) or a risk/reward ratio. The first trader could take more trades though; they could have traded each wave higher, collecting small winning trades each time. The two traders could end up with similar overall profits, but the first is more active (taking three trades) while the second trader is less active (one trade). As stated earlier, we can't be sure a trend will continue following a pullback. The trader who holds through some pullbacks is assuming it will, and by doing so will typically have larger winning trades. 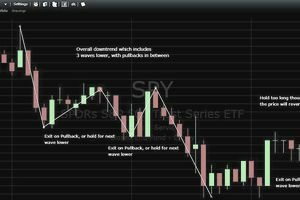 The trader who exits before a pullback, or near the start of a pullback, will typically have smaller winning trades but is likely to win slightly more often. The reason is that some trades that pullback will not continue to trend, and may reverse course. The trader who goes for the smaller profit takes their profit and is out of the trade before the reversal. The trader who holds through the pullback watches their profits evaporate and is now facing a losing trade. There is no right or wrong choice. Practice in a demo account and see which method results in the most consistent performance and profitability over many traders. Some traders may find they don't like holding through pullbacks and prefer to be more active, attempting to capture small profits from each price wave. Other traders may find constantly buy and selling drives them nuts, and holding each trade for a bit longer (and a potentially larger profit) is a better option. Define exactly how and why you will take profits, and write it down in your trading plan. Then follow those guidelines on each trade, so you know exactly what to do in a given circumstance, and so you aren't changing your approach with each trade or in the midst of a trade.